So far on this trip I have traveled from London to Saint-Malo by train and ferry and then continued on by train to Pontorson, a small town near the coast of northeastern Brittany. 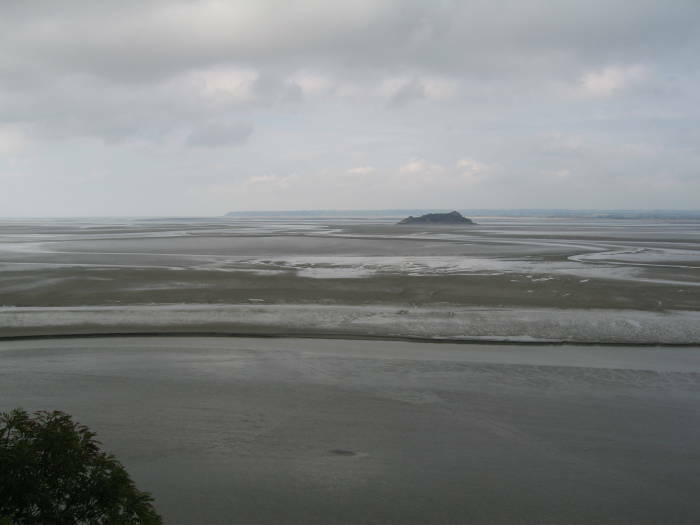 From here I will walk to Mont-Saint-Michel. Mont-Saint-Michel is the second most visited site in France after Paris itself, and it has been a significant ecclesiastical center and pilgrimage destination since the early 700s. The pictures and stories here are a composite of three visits to the area. My first visit was in the autumn of 2001, I returned in 2006 and 2010. 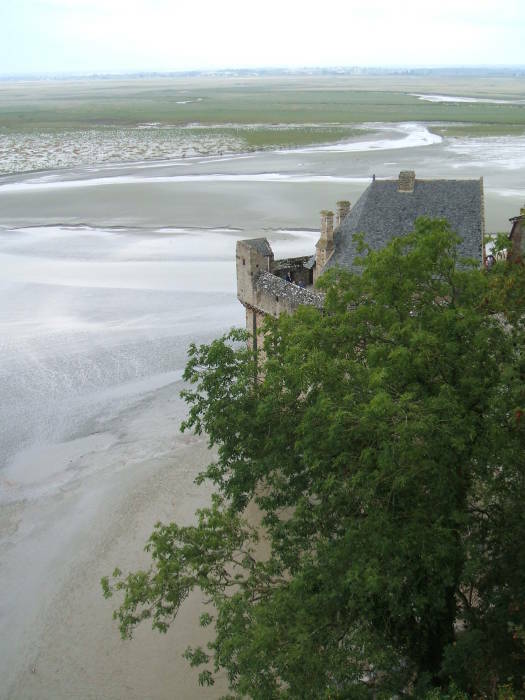 At the end of this segment we leave Mont-Saint-Michel and Pontorson by train for Chartres and Paris. 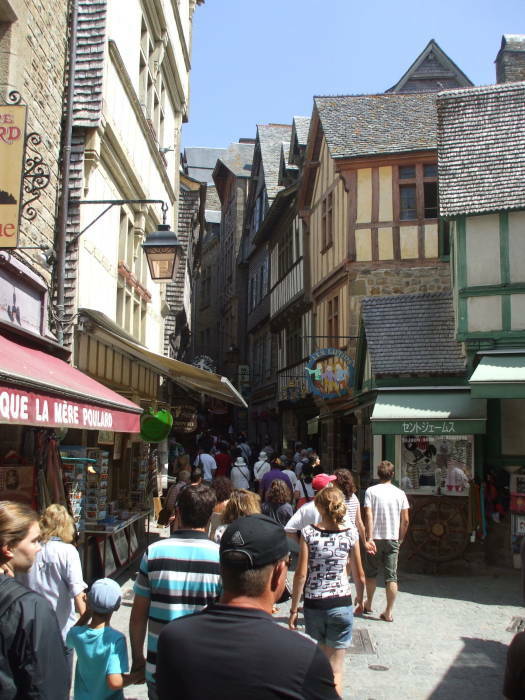 Mont-Saint-Michel is the second-most popular tourist attraction in France, behind only Paris itself. Well over one million people visit every year. It had been a major pilgrimage site in medieval times, so it seemed appropriate to approach it on foot. 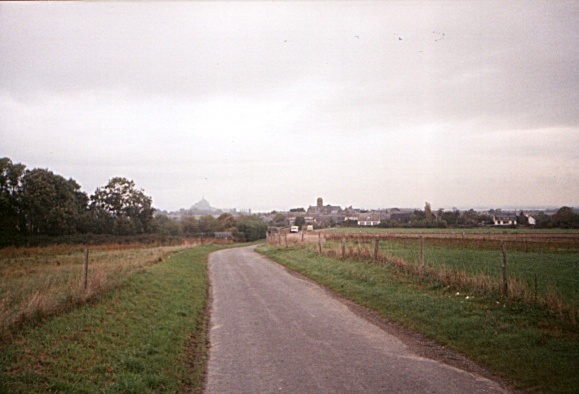 I took a route along back roads north from Pontorson, through the small villages of Moidrey and Beauvoir paralleling the main road toward Mont Saint-Michel. You can see the conical mont in the distance for most of the way. I had purchased a detailed yellow Michelin map #309 in Saint-Malo in anticipation of walking from Pontorson to Mont-Saint-Michel. The mount is a large granite outcropping, roughly conical and protruding out of the flat and sandy tidal plain. It's about 300 meters wide at the base and a little over 90 meters tall. It is one of several such outcroppings in the area, but it is by far the largest. Sea level was lower in prehistoric times because so much water was locked up in glaciers. The mount was inland from the sea. The glaciers melted, sea water rose, and history began to be recorded at least vaguely. Meanwhile the mount was connected only by a narrow causeway which continued to disappear. The Gaulish people called the large region Aremorica meaning are-mori or "on or at the sea". 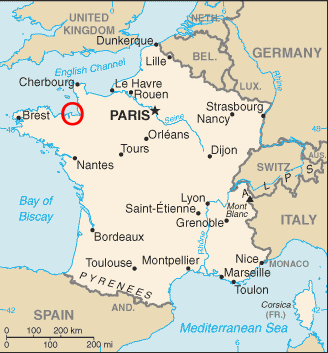 This was the area between the Seine and Loire Rivers, all of today's Brittany, Normandy, and more, The Romans changed that name only slightly to Armorica. Asterix was said to be from there, one of the "indomitable Gauls" who held out against the Romans. The Armorican people traded across the channel with Britain. Some of them held out on the mount, making it a last stronghold of Gallo-Roman culture into the 500s and 600s AD. The Franks finally took the place, forcibly joining it to Neustria, a realm created out of the division of the kingdom of the Merovingian leader Clovis. The locals called the outcropping Mont Tombe. Christianity had arrived in the area about the 300s AD. By the middle 500s, several Christian hermits occupied the mount. 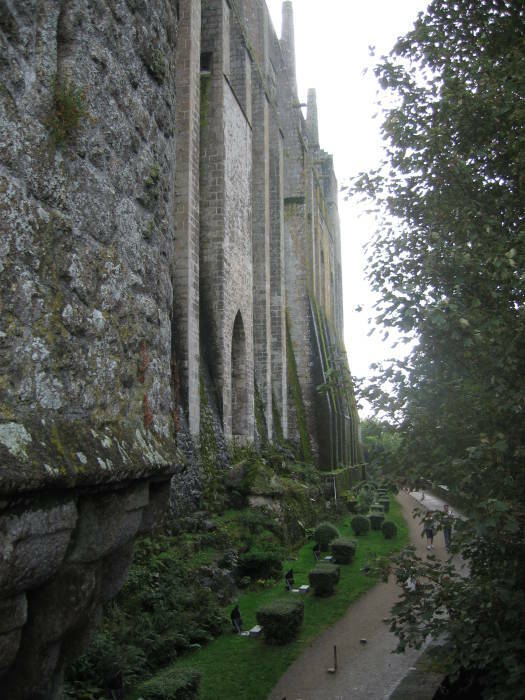 The hermits Pair and Seubilion dedicated shrines to Saint Symphorien at the base and to Saint Étienne about half-way up. 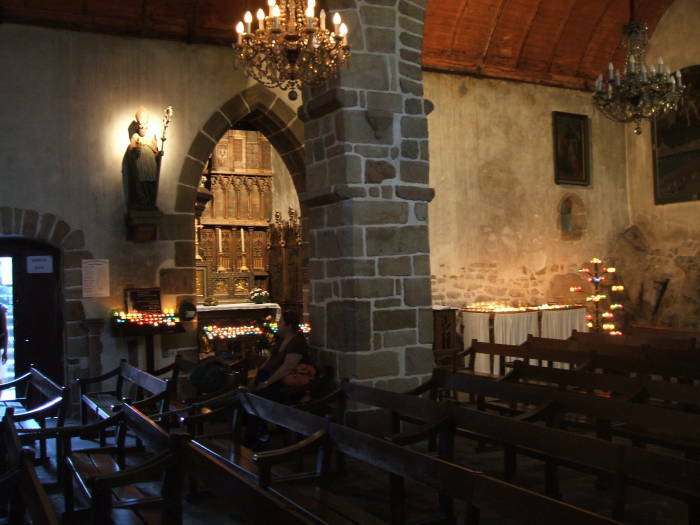 In 708 the Bishop Aubert of Avranches built an oratory to the Archangel Michael at the peak. The story is that Michael had appeared three times to Aubert in his sleep telling him to build a copy of the Gargano sanctuary in southeastern Italy. The archangel left the mark of his finger on Aubert's skull, which is on display in the Basilica Saint-Gervais d'Avranches if you care to inspect it. Aubert had an existing religious relic moved, had workers start building a circular sanctuary of unmortared stones, and sent two monks off to Italy to obtain some new relics. While they were gone, a tsunami in March of 709 washed away the last of the raised causeway. The monks returned with a rock bearing Gargano's footprint and an altar cover, and Aubert dedicated the new sanctuary. Now the mount was renamed as Mons Sancti Michaeli in Periculo Maris or Mount Saint Michael in Peril of the Sea. 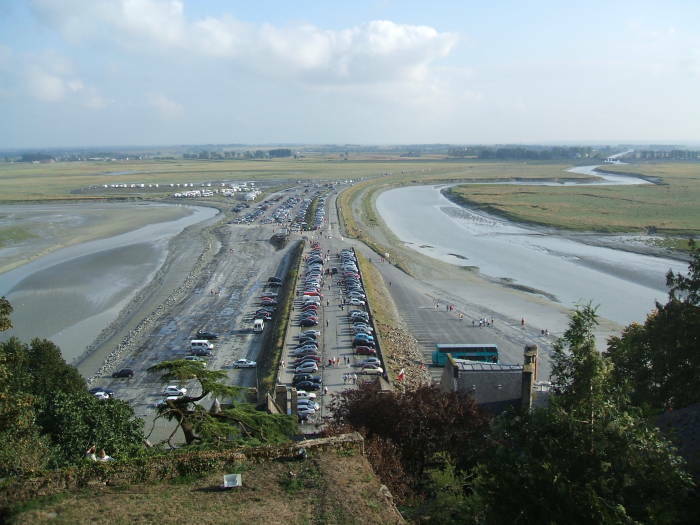 The mount itself wasn't in any danger, but the increasing number of pilgrims certainly were as they made their way across the tidal flats. 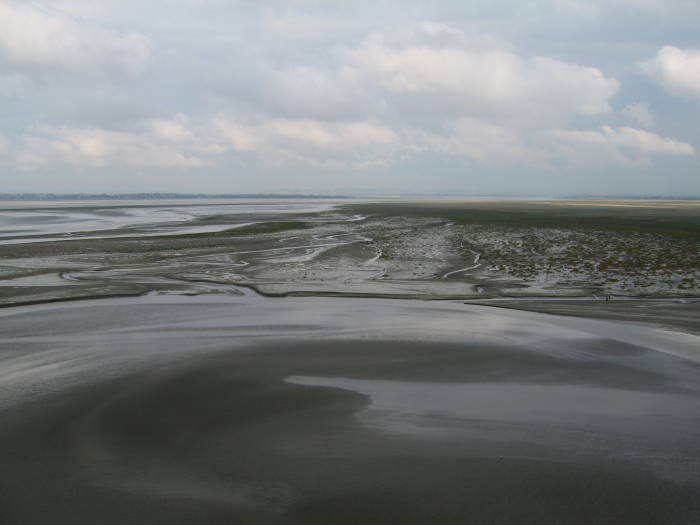 Without the causeway, access was limited to hurrying across the soft flats while the tide was out. The community grew and more buildings were constructed. Charlesmagne chose Saint Michael as the protector of his empire in the 800s, increasing the community's influence. Then the Vikings began assaulting the north coast of France. The Norsemen would come to be called Normans and their region of north-eastern Armorica/Neustria would be called Normandy. They captured the Mont in 847 and the monks left. The king of the Franks cut the Brittany peninsula loose in 867 in order to concentrate his forces elsewhere. The Treaty of Saint-Clair-sur-Epte was signed between the French King Charles III, inauspiciously known as "The Simple", and the Norman leader Gange-Hrólfr Ragnvaldsson, known as "Rollo", in late 911. It gave Neustria to the Normans in return for no more incursions into France. Rollo repaired the religious buildings and invited the monks to return. This began a period of rapidly growing wealth for the monastery. 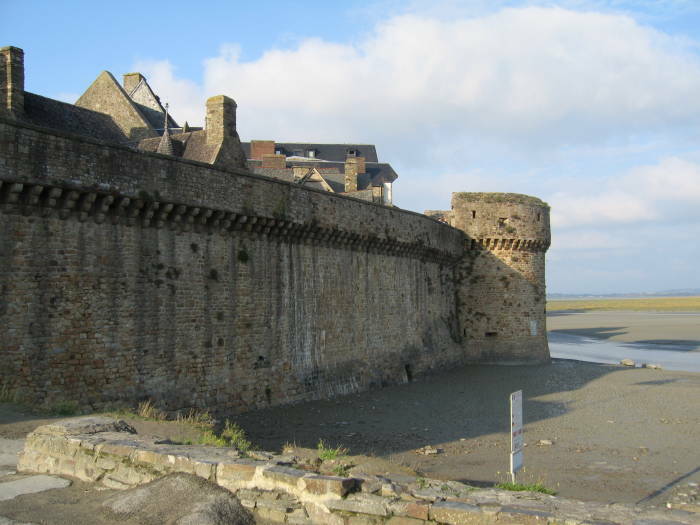 Vilhjálmr Langaspjót, known to the French as Guillaume Longue-Épée and to the English as William Longsword or William I of Normandy, took the area from the Dukes of Brittany in 933. The son of Vilhjálmr / Guillaume / William was Richard I, Richard Sans Peur or Richard the Fearless. 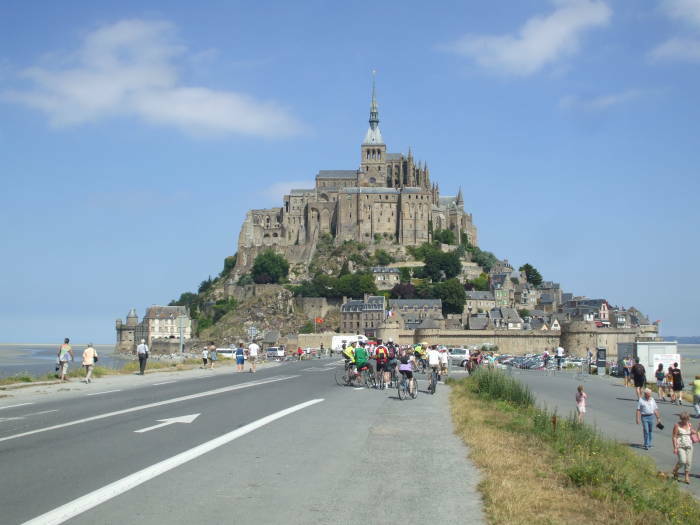 He thought it would be a good idea to force Mont-Saint-Michel into a more austere monastic lifestyle, and both Pope John XIII and King Lothair of France agreed. A Benedictine rule was imposed in 966. 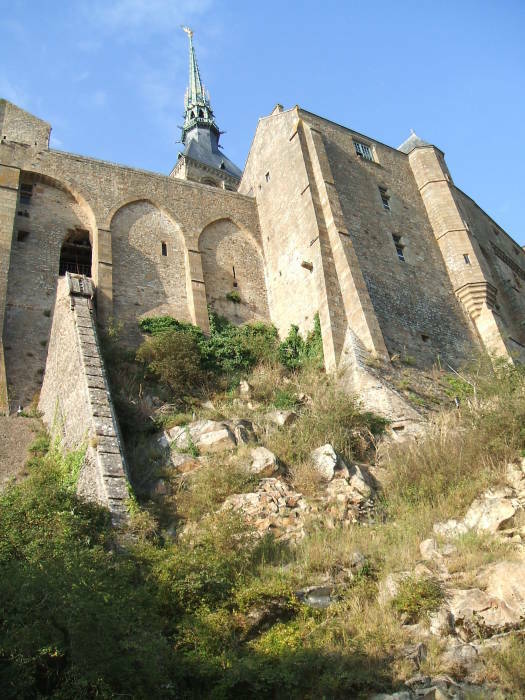 Richard strengthened the relationship between the Dukes of Normandy and the church, restoring church property and ensuring that the great monasteries flourished. 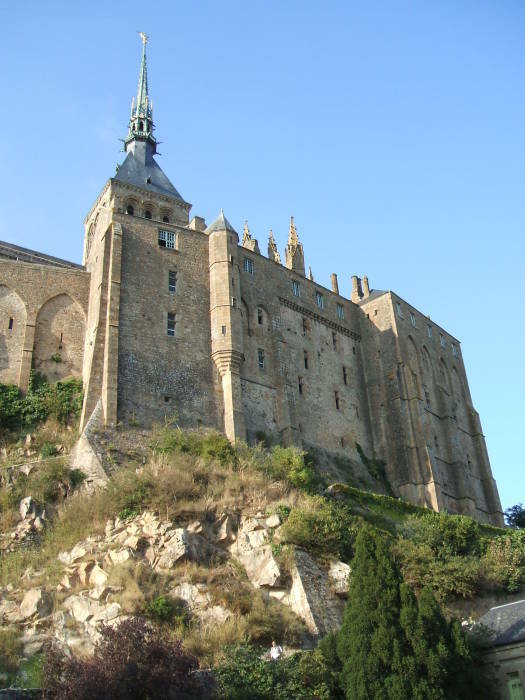 In the early 1000s, Richard II, Duke of Normandy, commissioned the construction of a large abbey on the mount. The transept crossing is at the very peak. Several lower chapels and crypts were built beneath to support the main church. Further construction continued over the following centuries. They built around Aubert's sanctuary from 709, so its remains are now in the chapel Notre-Dame-Sous-Terre (or Our Lady Under the Ground), beneath the main nave. The mount is shown in the Bayeux Tapestry as a part of Normandy, and the monastery supported William the Conqueror after his 1066 invasion of southern England. In return, William gave the monastery property in England. 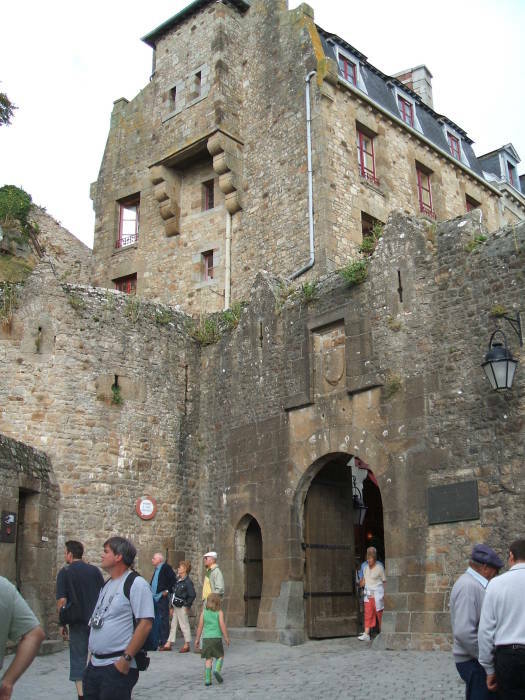 The population living within the walls grew to 300 to 400 people during the Middle Ages. The Benedictine monastery became very influential. Its monks were translating Aristotle directly from Greek to Latin. Up to that point, the only way northwestern Europeans learned about Aristotle was by reading translations from the Arabic archives in Toledo, in al-Andalus or Spain. Then the Reformation happened and the monastery's popularity as a pilgrimage destination waned. The monastery was closed during the French Revolution, by which point most of the monks had left anyway, and it became a prison. It initially held clerical prisoners, opponents of the anti-church Republican government. Then high-profile political prisoners were exiled there. 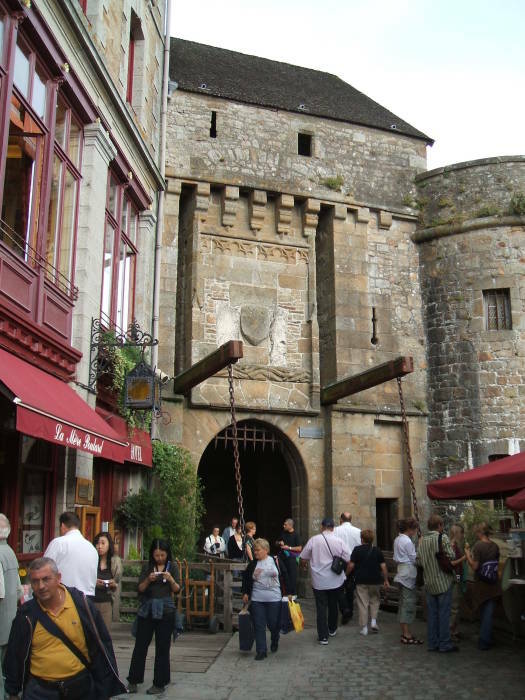 The prison closed in 1863 after a campaign led by prominent cultural figures including Victor Hugo, and it was declared a historic monument in 1874. Now only just over twenty people live within the walls. 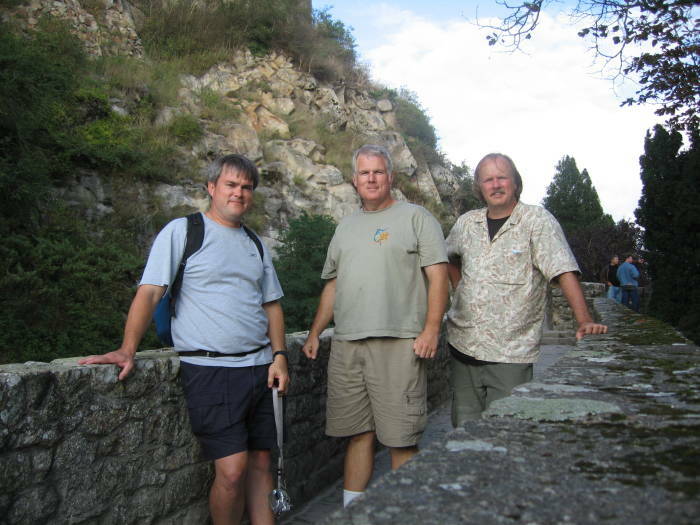 Here we are visiting in 2006. Tim, who organized that trip, is at left. Jeff in the middle, then me. We were staying in Sainte-Mère-Église and visiting the D-Day landing beaches on Utah Beach and Omaha Beach, plus Pegasus Bridge and other Allied landing areas. Then we traveled east, to Bastogne in southern Belgium and the Battle of the Bulge area. My first visit in 2001 was in late October. There weren't many visitors at that time of year. These pictures were taken on our visit in September, 2006, when everything was open but the crowds were small. Below are some pictures from a visit during June of 2010. It was much more crowded during the high season. 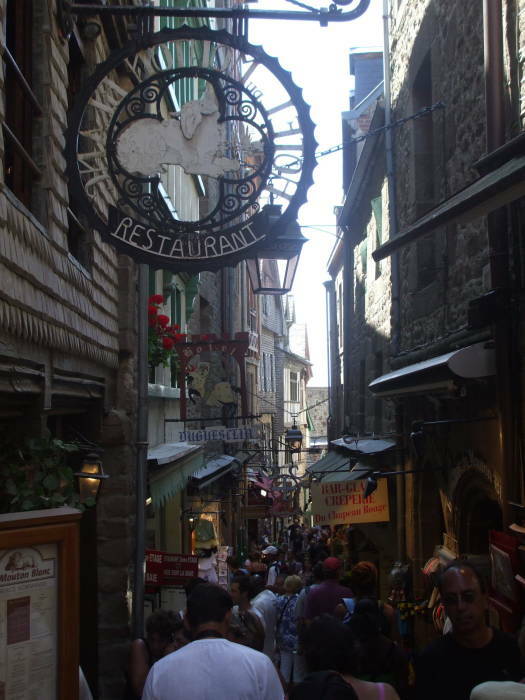 The one narrow passageway up toward the abbey was packed with people. 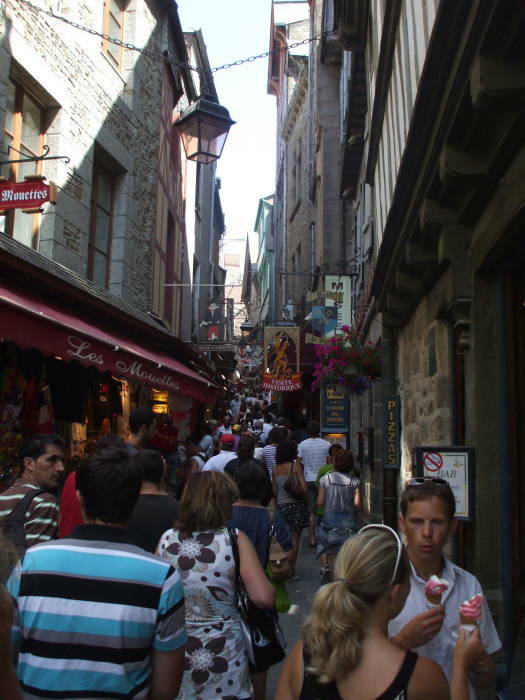 As I said, Mont-Saint-Michel gets very crowded during the high season. 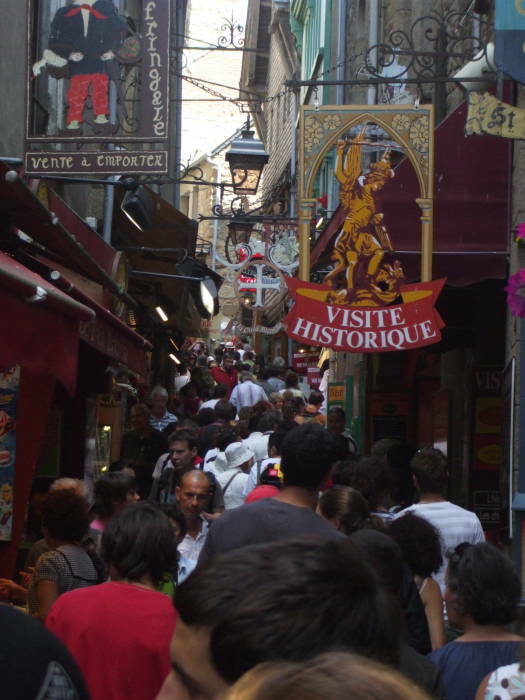 Whenever you visit, make your way through the gauntlet of places aimed at tired tourists in the first hundred meters or so. Before long you will be able to look up at the abbey and look out over the tidal area surrounding the mount. The other nearby large granite outcropping is Tombelaine. It's about 3.5 kilometers away, and is about 250×150 meters in size, 45 meters high. Two monks were hermits on the outcropping in the 1000s, and a priory was founded in 1137 and became a pilgrimage destination. 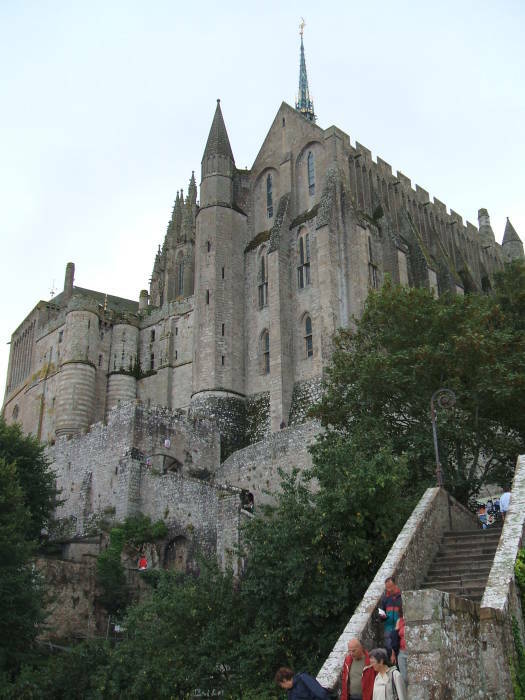 The English occupied it during their unsuccessful attempts to seize Mont-Saint-Michel in 1423-1424 and again in 1433-1434 during the Hundred Years' War. Later, in 1423-1424 and again in 1433-1434 during the Hundred Years' War, the English besieged the mount. However, they never took it. 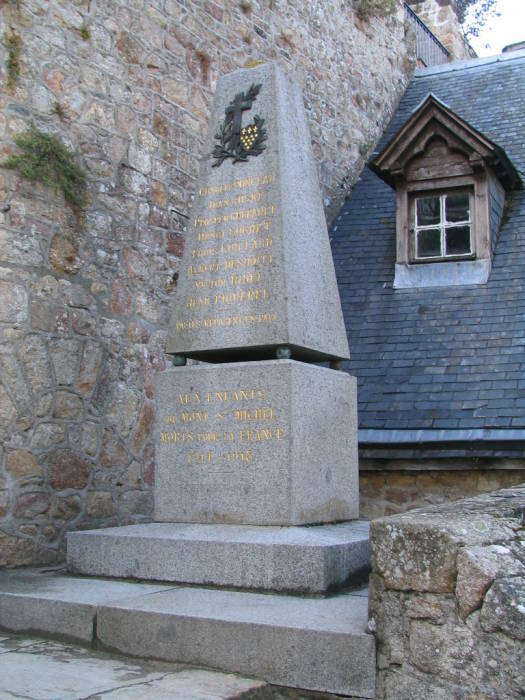 One theory is that the name Tombelaine means "the tomb of Princess Hélène", daughter of Hoel or Howel, a legendary king of Brittany. Very legendary, as he's one of the oldest characters of Arthurian myth. 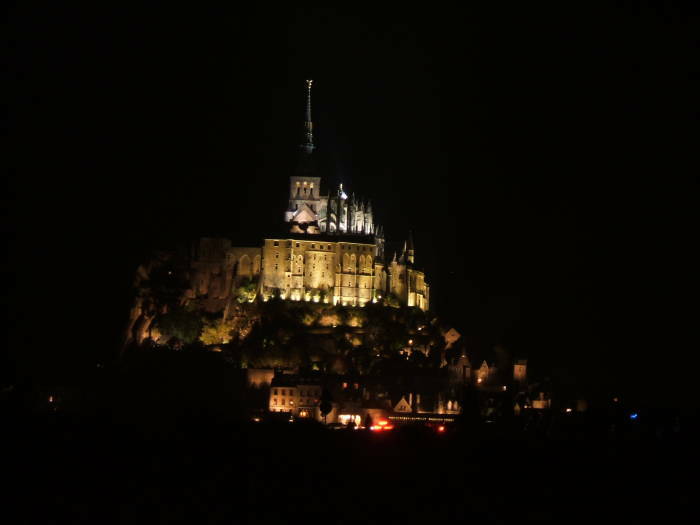 More plausible theories are that the name comes from tumulus belenis meaning the burial mound of the Celtic god Belenos, or from a Celtic name meaning "little mountain" as opposed to the larger Mont-Saint-Michel. 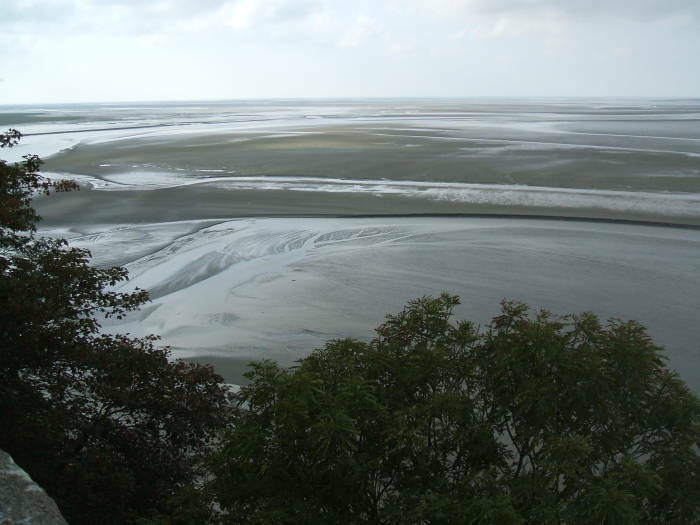 There are guided tours out across the tidal flats, carefully timed with the tides. 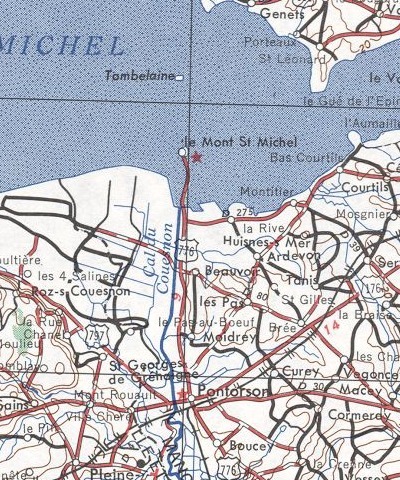 Some go as far as Tombelaine and back, 3.5 kilometers each way. Victor Hugo famously wrote that the tide moves "a la vitesse d'un cheval au gallop" or "as fast as a galloping horse" across the wide and soft tidal flats. Local farmers have built dikes and channels along some nearby areas along the normal waterline. 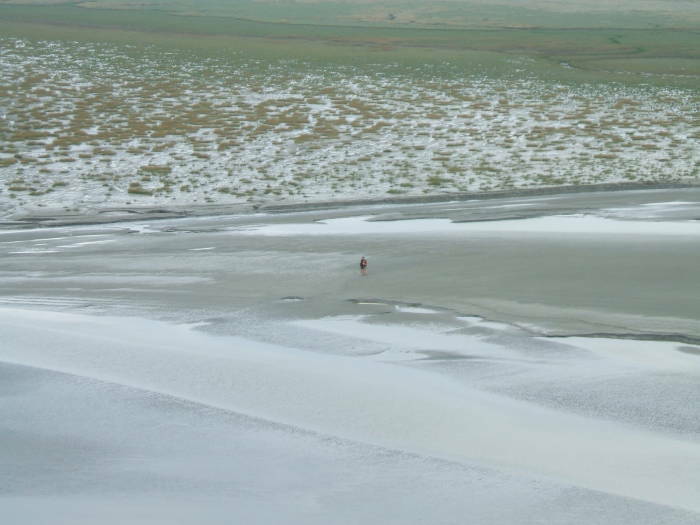 Sheep are raised there, mutton from sheep fed on the tidal flat are pre-salted. These alterations have changed the flow of the branching Couesnon River. A project has been underway for a few years working to restore a more natural state of this area. Looking back toward Pontorson over the new causeway and parking area, you can see the mostly natural end of the Couesnon and, in the distance, a more artificial stretch of it flowing between dikes. There is a memorial to the eight residents who were killed fighting the Germans in World War I. There were very few permanent residents living within the walls during that war, and almost none left by the time World War II started. 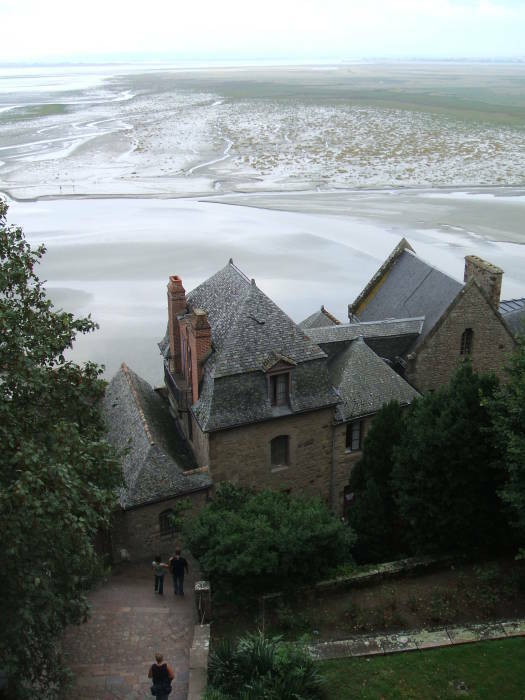 So, while many people living in the area were killed in that later war, none of them lived within Mont-Saint-Michel. Mont Saint-Michel is again a working church. 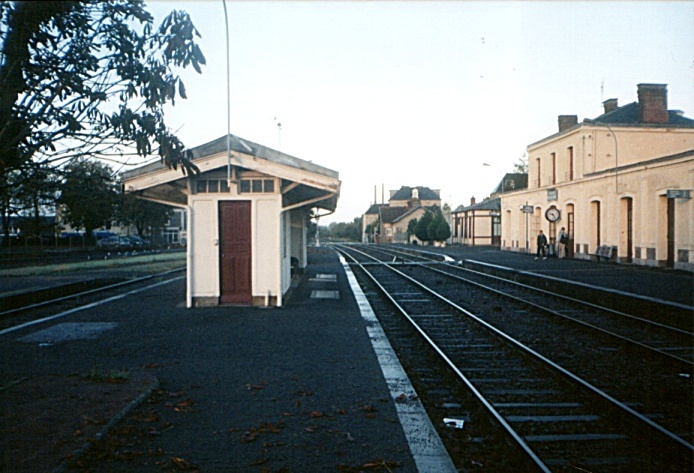 Services were restarted in 1922. Some Benedictine monks returned to the mount in 1966. In 2001 some brothers and sisters of the Monastic Communities of Jerusalem came from the church of Saint Gervais in Paris, replacing the Benedictine monks. They hold daily services, in the abbey some of the year and the a chapel in the crypt in winter. They established the Saint-Abraham Lodge in October 2012, where pilgrims can stay on a retreat. 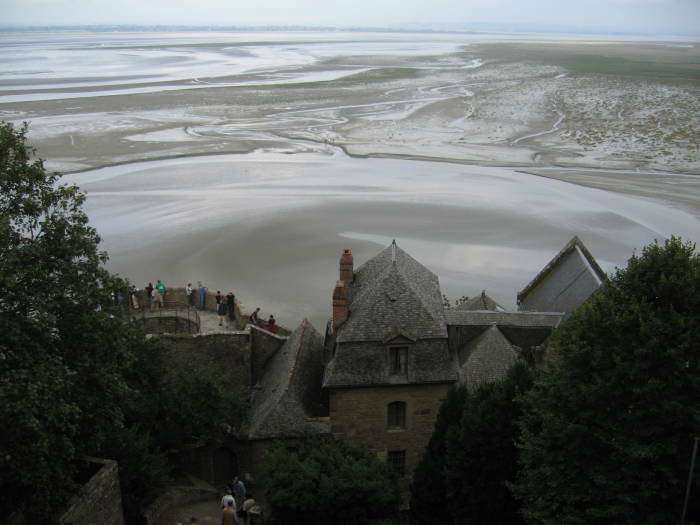 In all three visits the time eventually came to leave Mont-Saint-Michel. In 2001 I took a bus back to Pontorson as dusk began to fall. 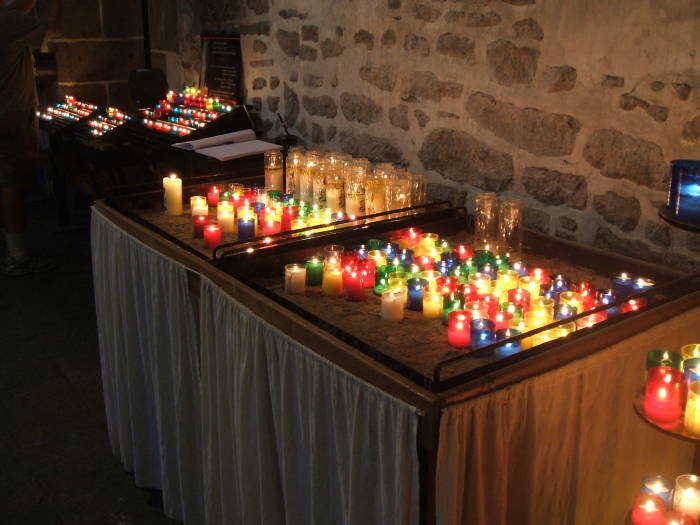 In 2006 we stayed until after dark, making for a late return to Sainte-Mère-Église. 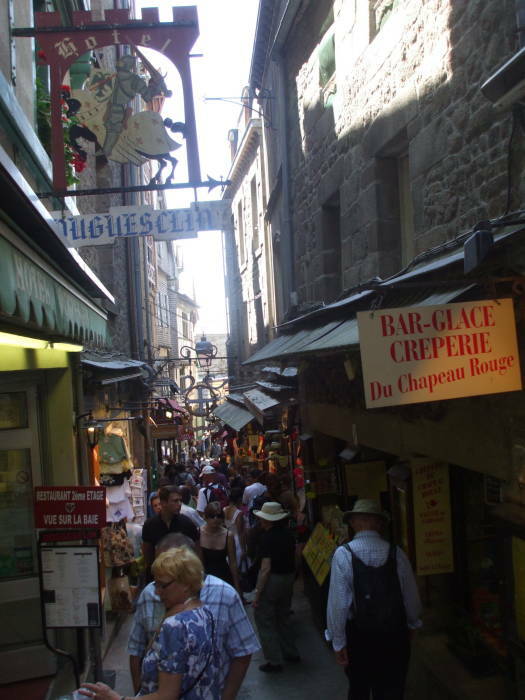 In 2010 we were headed the other direction, toward a short visit to Saint-Malo. Now back to the 2001 overland trip to finish the route. 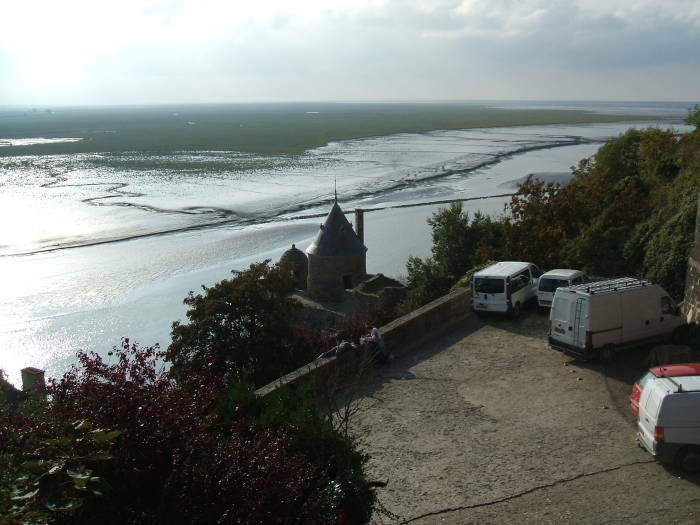 I returned from Mont-Saint-Michel to Pontorson on a bus. I had dinner in the Hôtel de la Post restaurant. It was about the only place open on a Monday evening in late October. There were very few cars moving around and no one else out on foot. Then I hung out the rest of the evening in the bar downstairs at my hotel, Le Clarisse. There were a few locals in there. An older guy came in later, shaking hands all around. "Bonsoir, monsieur, bonsoir." He gave me a surprised look as I was obviously not one of the regulars. I went to the Pontorson train station the next morning and caught a train out of Pontorson. I spent most of the day getting to Chartres with stops in Rennes and Le Mans. I stayed at the Hôtel Jehan de Beauce in Chartres, another basic 160 FF or $22 place just across the square from the station. After a day in Chartres visiting the magnificent cathedral, I continued to Paris. I stayed in the Quartier Latin, at the Hôtel de Médicis. I had a room on the next-to-top étage, with an unlevel floor with ancient linoleum, a blocked-off fireplace, a sagging bed, a battered table and chair, a sink and bidet, and a window looking out to surrounding rooftops. All of it smelled slightly of marijuana smoke. It was a great place to stay! See the book Grand Hotel: Redesigning Modern Life, which accompanied an exhibition at the Vancouver Art Gallery. They used my original scans of some of my pictures in its chapter on the Hôtel de Médicis. I had to continue onward from Paris to Frankfurt and fried pork, where I would do the second job teaching network troubleshooting to EMC. 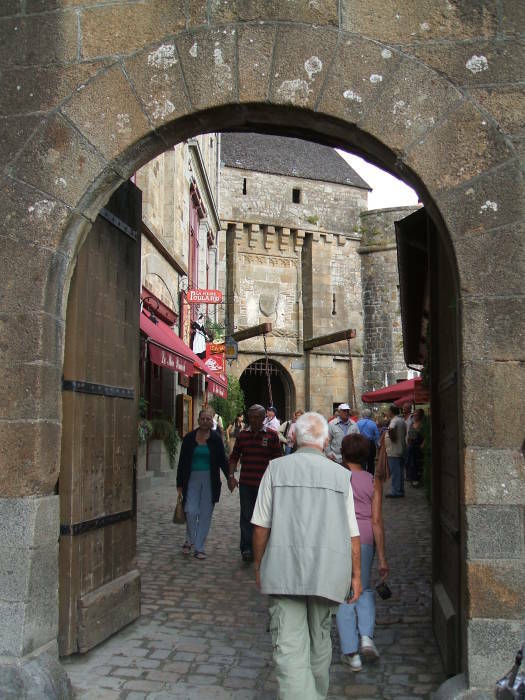 If you finished your trip along the Brittany coast you can choose another destination in France. 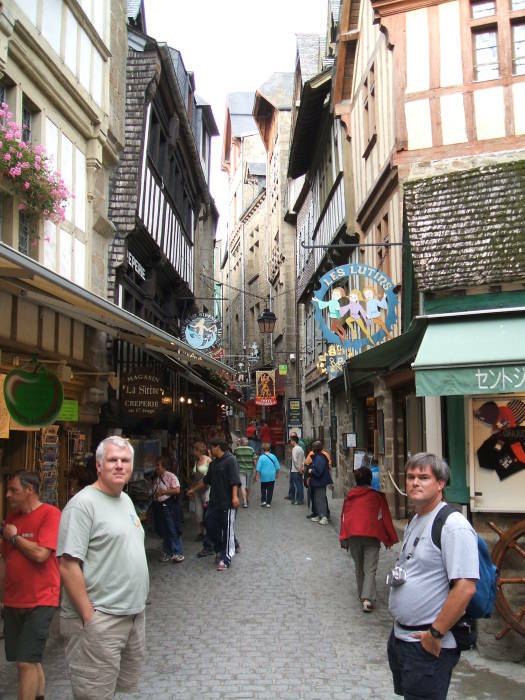 Or you might have entered in the middle and want to go back to the start of this trip, by ferry from England to Saint-Malo. Or, the step just before this one, Pontorson.